The groups differ in other ways as well. Compared with all mothers with children under age 18, married mothers who out-earn their husbands are slightly older, disproportionally white and college educated. Single mothers, by contrast, are younger, more likely to be black or Hispanic, and less likely to have a college degree. The impact the recession may have had on this trend is unclear.4 However, a Pew Research Center survey conducted in November 2012 found that mothers’ views about whether and how much they would like to work had changed significantly since 2007 (before the recession officially began). The share of mothers saying their ideal situation would be to work full time increased from 20% in 2007 to 32% in 2012. And the share saying they would prefer not to work at all fell from 29% to 20%. A new Pew Research Center survey finds that the public remains of two minds about the gains mothers have made in the workplace–most recognize the clear economic benefits to families, but many voice concerns about the toll that having a working mother may take on children or even marriage. 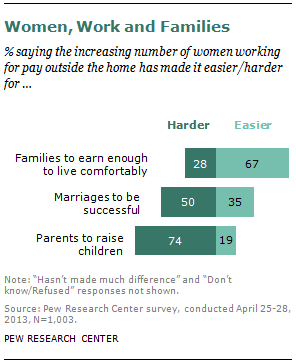 About three-quarters of adults (74%) say the increasing number of women working for pay has made it harder for parents to raise children, and half say that it has made marriages harder to succeed. At the same time, two-thirds say it has made it easier for families to live comfortably. While the vast majority of Americans (79%) reject the idea that women should return to their traditional roles,5 the new Pew Research survey finds that the public still sees mothers and fathers in a different light when it comes to evaluating the best work-family balance for children. 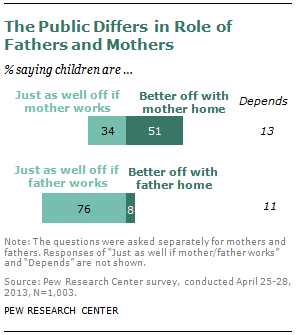 About half (51%) of survey respondents say that children are better off if a mother is home and doesn’t hold a job, while just 8% say the same about a father. young adults are less concerned than older adults about the trend. About four-in-ten adults under age 30 (42%) view it as a big problem, compared with 65% of those in their 30s and 40s and 74% of adults who are 50 and older. 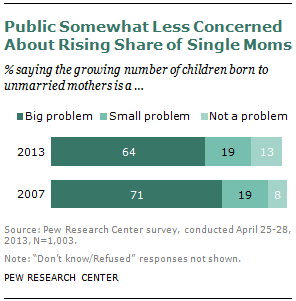 The public’s opinions about unmarried mothers also differ by party affiliation and race. Republicans (78%) are more likely than Democrats (51%) or independent voters (65%) to say that the growing number of children born to unwed mothers is a big problem. 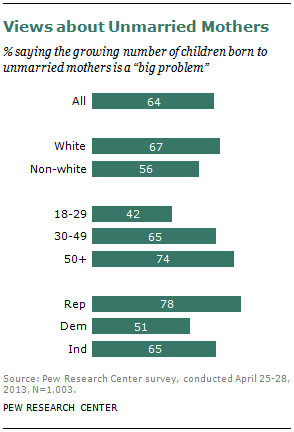 Whites are more likely than non-whites to view it as a big problem (67% vs. 56%). The views of men and women on this issue are the same. Data for this report are mainly from Pew Research analysis of multiple years of Census Bureau data as well as a recent Pew Research survey conducted by landline and cellular telephone April 25-28, 2013, among a nationally representative sample of 1,003 adults living in the continental United States. More detailed information about the data sources can be found in Appendix 2. Both groups of breadwinner mothers, married and single, have grown in size in the past five decades. Of all households with children younger than 18, the share of married mothers who out-earn their husbands has gone up from 4% in 1960 to 15% in 2011, nearly a fourfold increase. During the same period, the share of families led by a single mother has more than tripled (from 7% to 25%). The total family income is higher when the mother, not the father, is the primary breadwinner. In 2011, the median family income was nearly $80,000 for couples in which wife is the primary breadwinner, about $2,000 more than it was for couples in which husband is the primary breadwinner, and $10,000 more than for couples in which spouses’ income is the same. Married mothers are increasingly better educated than their husbands. Even though a majority of spouses have a similar educational background, the share of couples in which the mother has attained a higher education than her spouse has gone up from 7% in 1960 to 23% in 2011. In two-parent families today, 61% have a mother whose education level is similar to her husband’s, 23% have a mother who is better educated than her husband, and 16% have a father who is better educated than his wife. Most people reject the idea that it is bad for a marriage if a wife out-earns her husband. When asked if they agree or disagree that it is generally better for a marriage if a husband earns more than his wife, some 28% of survey respondents say they agree and 63% disagree. When a similar question was asked in 1997, 40% said they agreed. In the new survey, adults with a high school diploma or less were twice as likely as those with a college degree (35% vs. 18%) to say it is generally better for a marriage if a husband out-earns a wife. There were no significant differences between men and women on this question. Today’s single mothers are much more likely to be never married than were single mothers in the past. 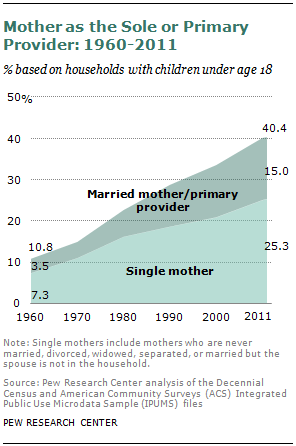 The share of never married mothers among all single mothers has increased from 4% in 1960 to 44% in 2011. During the same period, the share of single mothers who had children from previous marriages has gone down from 82% to 50%. Never married mothers have a distinctive profile. Compared with single mothers who are divorced, widowed or separated, never married mothers are significantly younger, disproportionally non-white, and have lower education and income. Close to half of never married mothers in 2011 (46%) are ages 30 and younger, six-in-ten are either black (40%) or Hispanic (24%), and nearly half (49%) have a high school education or less. Their median family income was $17, 400 in 2011, the lowest among all families with children.